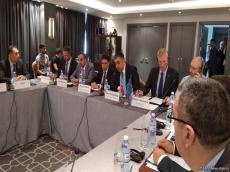 Azerbaijan Ministry of Transport, Communications and High Technologies in cooperation with UNCTAD (UN Conference on Trade and Development) plans to prepare the national strategy for e-commerce development in the country, Minister Ramin Guluzade said on July 11. “In recent years, e-commerce has been developing dynamically in Azerbaijan. In 2016 the volume of retail e-commerce in the country amounted to 25 million manats ($14.68 million), but in 2017 this figure exceeded 46 million manats ($27.02 million),” Guluzade said, adding that according to the UNCTAD E-commerce Index, Azerbaijan ranks the 68th among 144 countries in the world. The minister further noted that it is planned to organize an international forum on e-commerce in Baku in September. The event is planned to be held jointly with the European Union, the UN and other international organizations. Guluzade said that the Ministry and the EU have been implementing an e-commerce development project since 2017, and serious work is being carried out within it to bring the e-identification system in line with EU standards. “To develop e-commerce in the country, the law on e-commerce was adopted, and the national strategy for 2014-2020 was adopted for the development of information society. In addition, strategic road maps were adopted for the development of the economy as a whole and its individual sectors,” the minister noted. He further reminded that in 2016, the Azexport.az e-commerce portal was created in the country in accordance with the presidential order. Moreover, the Digital Trade Hub, which plays an important role in ensuring transnational trade operations, was created to strengthen Azerbaijan’s position as a digital trade hub and expand trade relations with other countries. “The geostrategic location of Azerbaijan creates new opportunities for the delivery of orders by mail. Today, a project of regional importance in e-commerce is already being implemented, which allows Azerpost to act as a regional postal center and deliver goods through e-commerce,” Guluzade noted. He mentioned that the goods ordered from China’s e-commerce platforms are delivered to Azerbaijan and processed by Azerpost, and after that they are delivered to more than 20 countries by AZAL and SilkWay companies. Deputy Chairman of the State Customs Committee (SCC) Iqbal Babayev, in turn, said that mobile phones imported by individuals into Azerbaijan for personal use shall not be used for commercial purposes. He noted that the SCC, together with the Ministry of Transport, Communications and High Technologies of Azerbaijan, takes measures to curb these activities. “Presently, the situation in the market is such that it is not possible to get information about who is engaged in commercial sales of phones. Together with the Ministry, we are implementing a joint project that will prevent individuals’ commercial sale of mobile devices for personal use,” Babayev said. He added that the situation can be radically changed through legal regulation, improvement of postal and logistics services. “At the same time, it is absolutely necessary to ensure customer satisfaction. It is necessary to make sure that e-commerce in Azerbaijan makes its contribution to the world e-commerce market,” Babayev said. Speaking to reporters on the sidelines of the conference, head of the EU Delegation to Azerbaijan Kestutis Jankauskas said that it is necessary to develop e-commerce for enhancing partnership between the EU and Azerbaijan. “The event is about looking where we are in developing e-commerce opportunities in Azerbaijan. The EU has a project worth 300,000 euros ongoing since last year. It should be finished this year. This is about bringing our EU best practices and expertise in this area working with the Ministry of Transport and ICT,” he said. Jankauskas noted that Azerbaijan is an important partner of Europe. “We are working hard on the new project for transportation hub which connects this region to Europe and Europe to Central Asia and to huge Chinese market. For that to succeed, we need to create opportunities for safe, reliable routes, transportations, links and trade,” he added. Noting that the EU is the biggest trade partner of Azerbaijan, Jankauskas said that to keep and enhance this, it is necessary to ensure the development of e-commerce and e-services for people within the country and for the international traders. E-commerce offers several advantages over ordinary paper-based commerce, such as its convenience and transparency. E-commerce transactions are always recorded, since both the merchant selling the product or service and the buyer keep a record. Moreover, e-commerce provides access to products and services from all over the world. Today it is safe to say that e-commerce will become one of the most important trends in the Azerbaijani economy in the next few years.